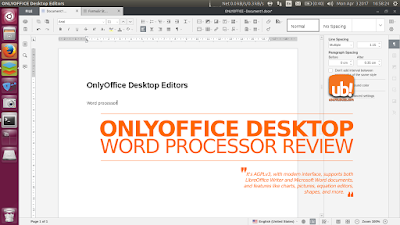 Following previous article, it's an overview to OnlyOffice word processor. I divide this article to 3 parts: user interface, equation editor, and document formats. The OnlyOffice word processor resembles WPS modern interface and it's compatible with .odt & .docx documents. It's a good replacement for WPS Writer or Microsoft Word when you want ribbon-like interface and Word document compatibility. OnlyOffice is free software licensed under GNU AGPLv3 and available for GNU/Linux. The user interface reminds us to Microsoft Office 2010-2013 or WPS Office. But OnlyOffice Desktop has multitab feature, something you don't see on LibreOffice, OpenOffice, Calligra Suite, and MS Office (except on IBM Lotus Symphony and WPS Office). Edited April 5th 2017: I'm sorry I previously stated WPS does not have multitab (that's wrong), thanks to our reader Platypus for the correction about the fact WPS does have it. 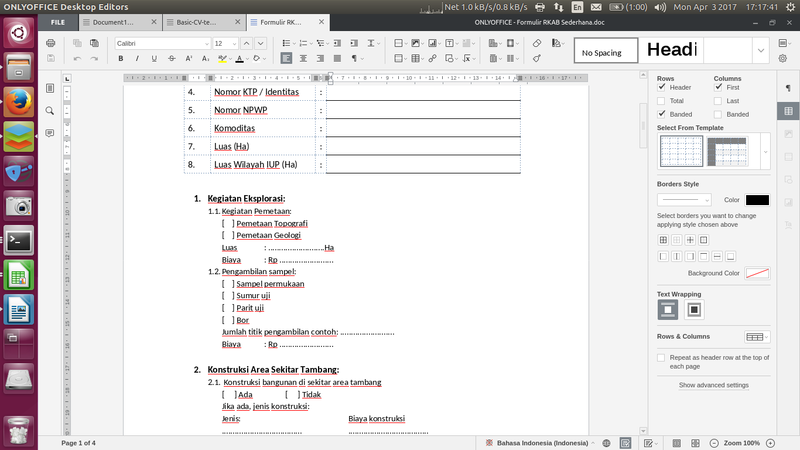 To be honest, it resembles Microsoft Office 2010 more than LibreOffice. I'm glad GNU/Linux now has a free office suite with modern ribbon-like interface. Modern toolbar with multitab feature. You don't need to open many windows in one time anymore. As a consequence, it has no normal menubar and on Unity it shows no global menu. The default statusbar features page info, language detection, spellcheck, changes tracker, fit width, and zoom. 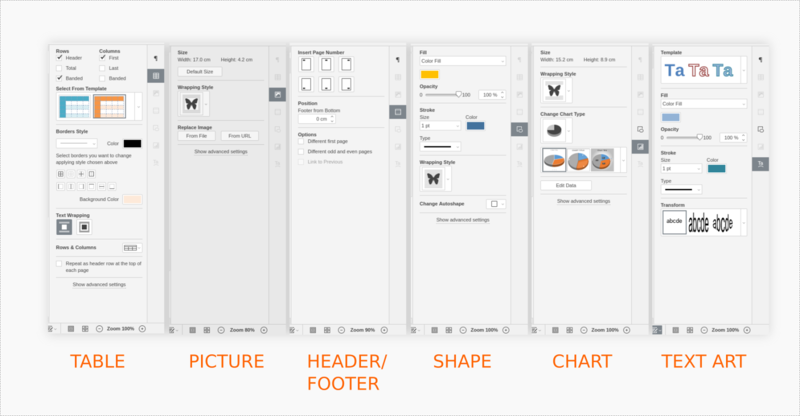 The sidebar is properties viewer for paragraph, table, picture, header/footer, shapes, charts, and Text Art (similar to Word Art, Fontwork). Actually OnlyOffice has online-collaboration principle so changes tracking is a common feature here. It can show who changes what part and when in a document. It's easy to access preferences dialog. For an office suite, this dialog seems too short. You don't see any shortcut keys or macro setting here. 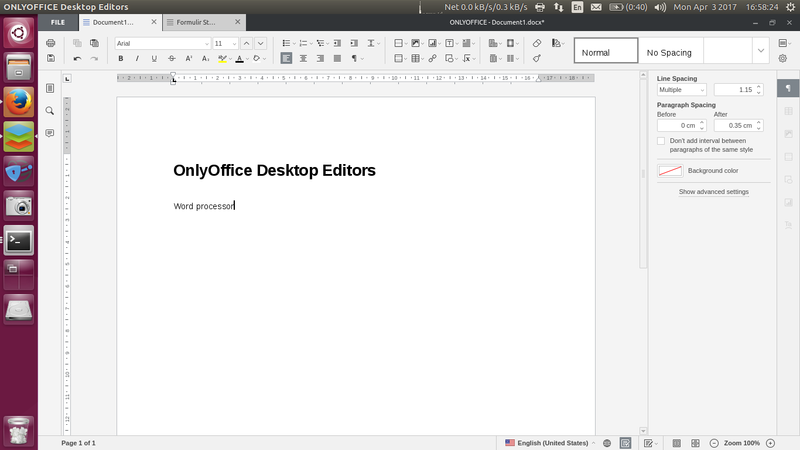 I wish later development of OnlyOffice will bring more complete settings like LibreOffice. 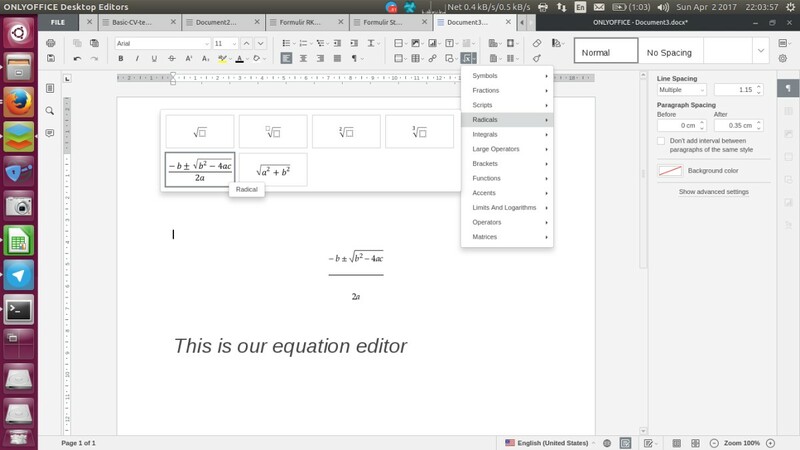 The word processor includes equation editor right on the toolbar. To compare it: we find no equation editor on WPS for GNU/Linux, and no such drop-down selection on LibreOffice Writer without opening Math. 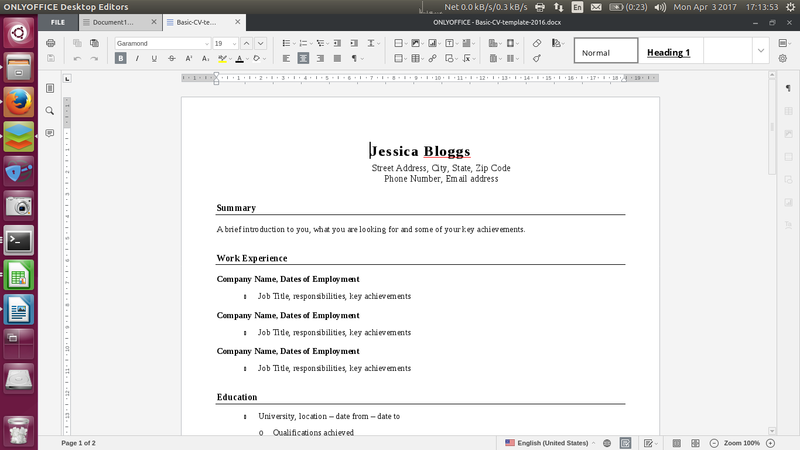 It supports both LibreOffice Writer format (.odt) and Microsoft Word format (.doc, .docx). And it supports Export as PDF. I downloaded some .docx from the net and read it on OnlyOffice. You can download the same file (Basic CV 2016). 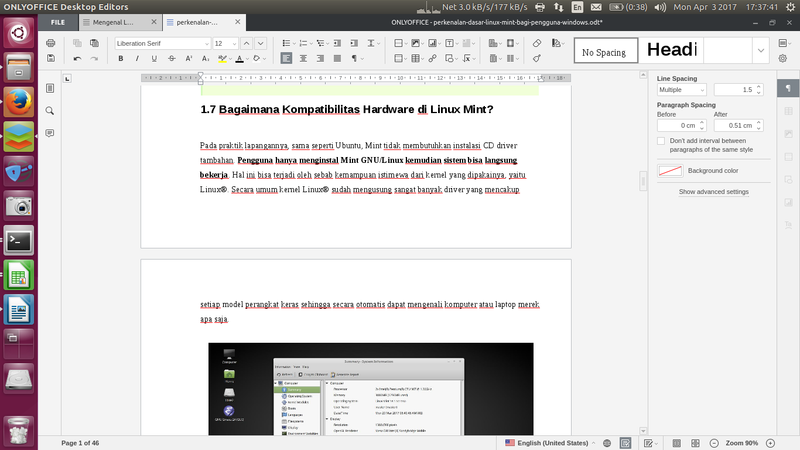 Comparing it to Writer, OnlyOffice can read this .docx well by keeping the structure. I asked my friend for some .doc files and he kindly gave me the files to show them here (although he didn't permit me to display his name). This file features a table and bullets & numberings. It shows OnlyOffice can read them well. I read my own .odt file on OnlyOffice here. This .odt features table of contents, pictures, headings, bullets & numberings, and special ASCII character. I have some problems in reading the page margins (showing no margins) and the first-page background picture (it seems it failed to read the Page Style correctly). But overall it's good, while the table of contents can be read and special char '®' read well. 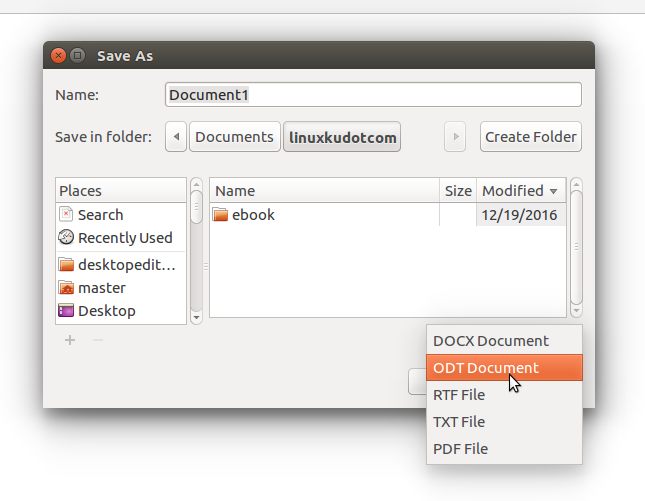 You can download the .odt file here. 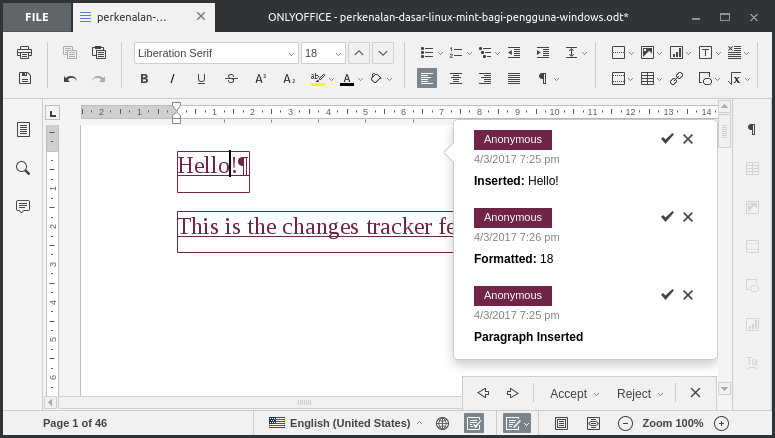 When I heard OnlyOffice for the first time from alternativeto.net, I was very glad to see a new office suite for GNU/Linux. It attracted me more and more until I installed it (after seeing it's free software). Anyhow, I like its user interface so much. 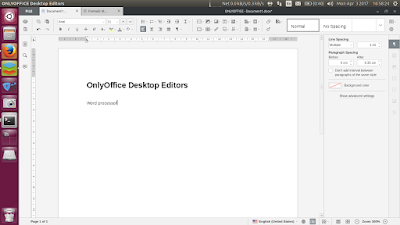 I wish the development of OnlyOffice Desktop Editors continues with good support from our community, gets huge receptions from many distros, and soon available on Ubuntu official repository. My another wish is so that deepin GNU/Linux replaces WPS with OnlyOffice for later release. My great thanks to Ascensio System SIA for developing OnlyOffice.